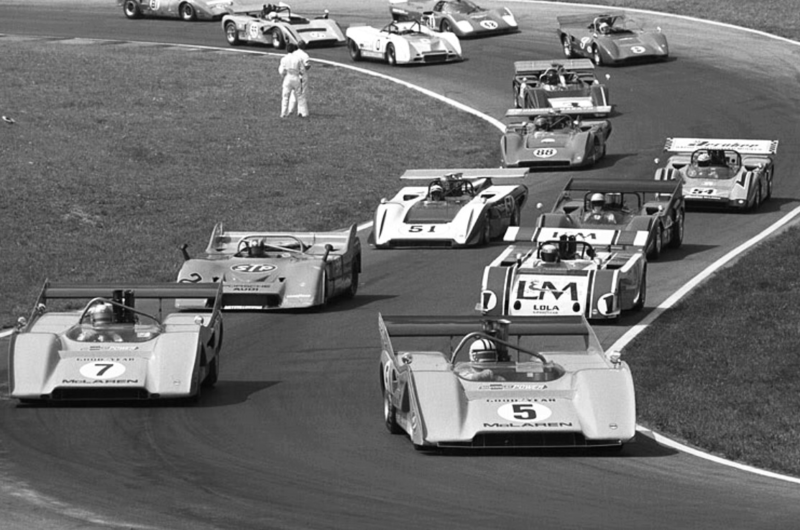 The CanAm Championship morphed out of a series of professional level sports car races which had taken place for over a decade. 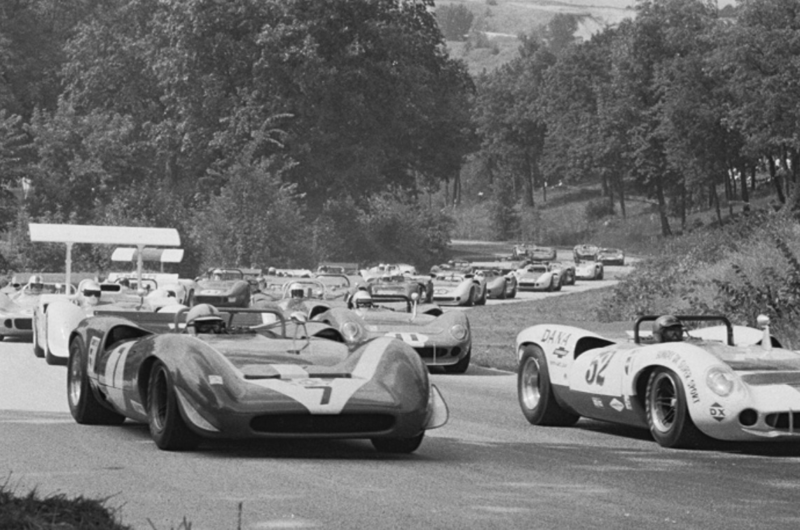 In 1965 this comprised 4 events, 3 won by the Chaparral 2 and 1 by a Lola T70. 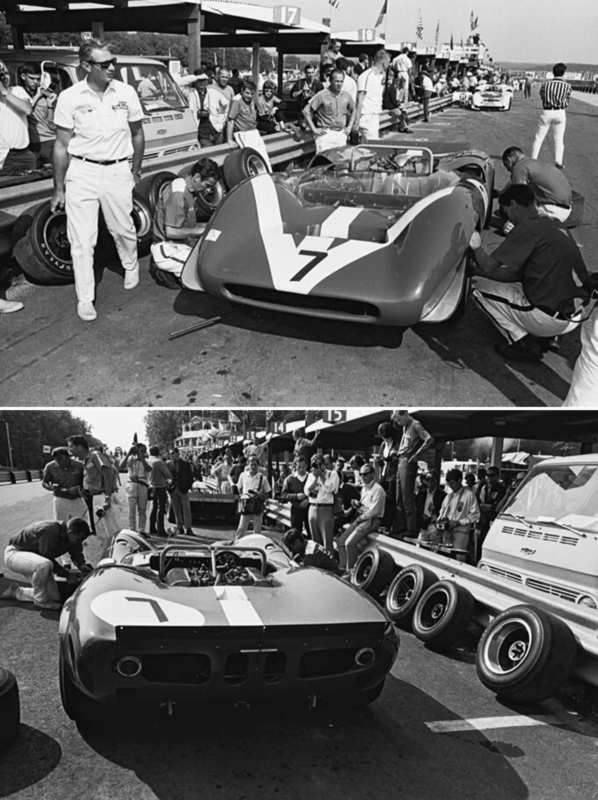 The first CanAm series held in 1966 was won by John Surtees in a quasi-works Lola T70; ‘Big John’ won 3 races, Dan Gurney and Mark Donohue 1 apiece in Lola T70’s as well with Phil Hill taking a race in a Chaparral 2E. Whilst Colin Chapman designed the first ‘modern monocoque’ single-seater, the Lotus 25, which made its debut at Zandvoort in 1962, it was Eric Broadley who first applied the new construction technique to a sports-racer with his 1963 Lola Mk6 Ford. Chapman was convinced the backbone chassis which worked so well in his Elan road would migrate to sports-racing success but the Lotus 30/40 chassis were as floppy as a centenarians todger with results reflecting same. 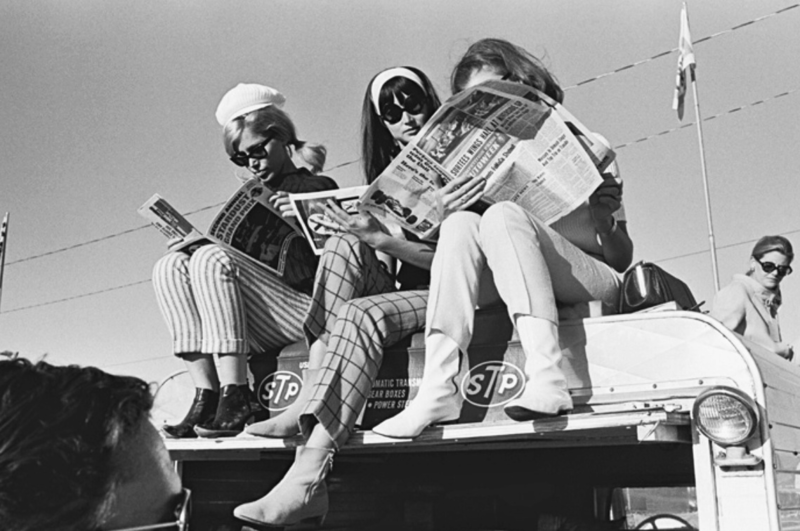 Even Jim Clark could not make those cars sing. 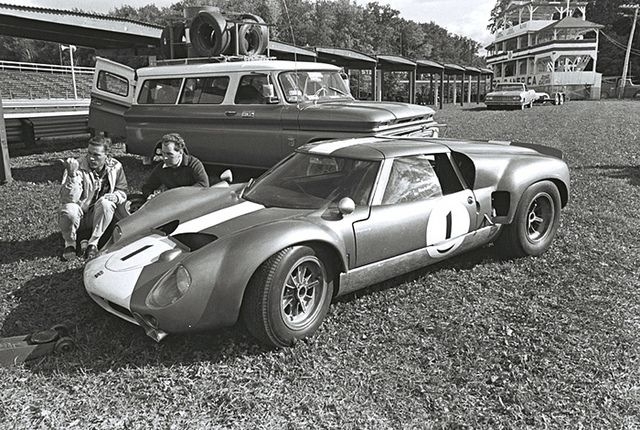 So impressed were Ford with Eric’s Mk6 he was famously contracted to lead the design team of its GT40, a car with a steel tub. The aluminium tubbed T70 was one of his first designs after his ‘Ford sabbatical’, that design process useful in terms of evolving the car Eric thought Ford should have built in the first place! 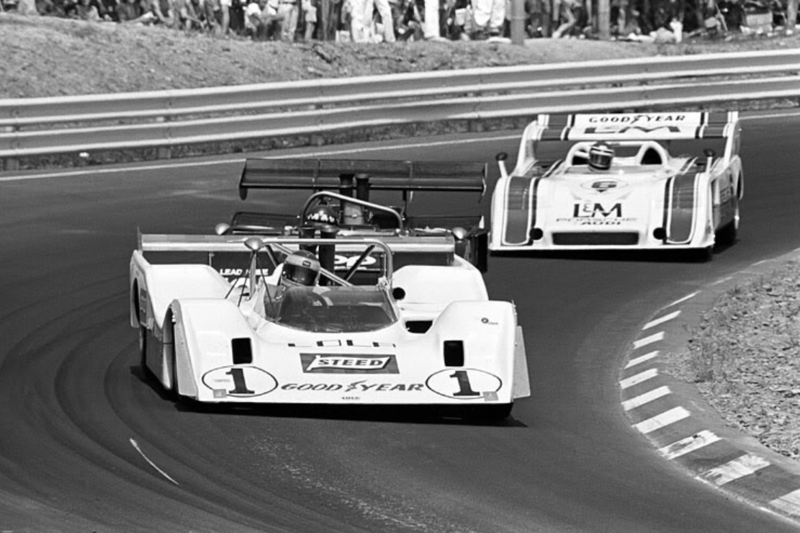 In all it’s variants the T70 remained a ‘competitive tool’ in both Group 7 (CanAm) and Group 5 World Sports Car Championship events into the dawn of the 1970’s, Teddy Pilette qualified his Team VDS Mk3B 19th at Le Mans in 1971, not bad for an old car with a pushrod OHV V8 against the might of the 5 litre, 12 cylinder Porsche 917 and Ferrari 512! 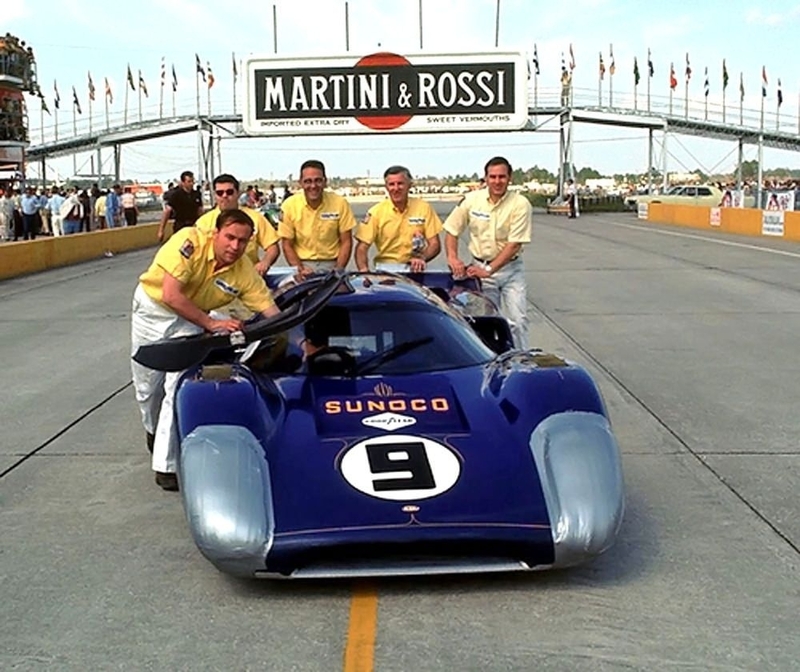 In endurance racing the T70 was really only held back by a suitable engine, the 12/24 hour longevity or lack thereof of the Chev engines usually chosen to power it. The small block Chev not having the benefit of factory investment in its development in the same way Ford’s Le Mans winning small block ‘Windsor’ V8 did. 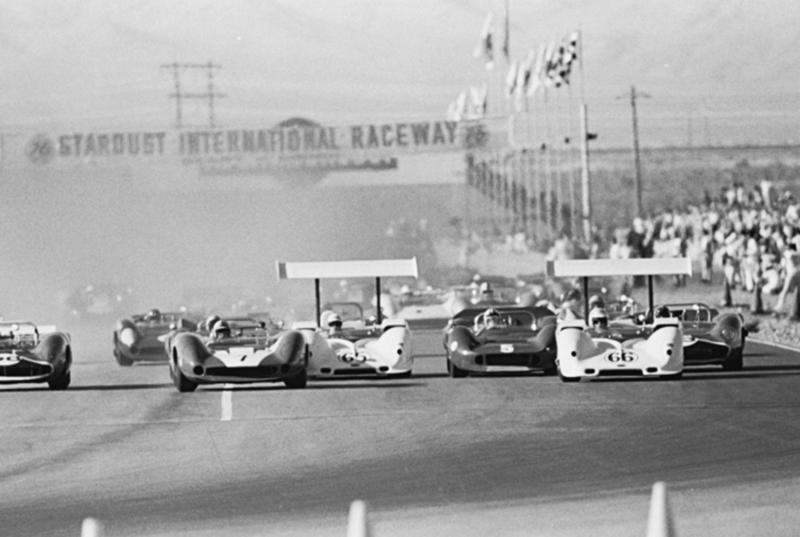 Things would get tougher for Lola, Chaparral and the rest of the grid for the 1967 CanAm. 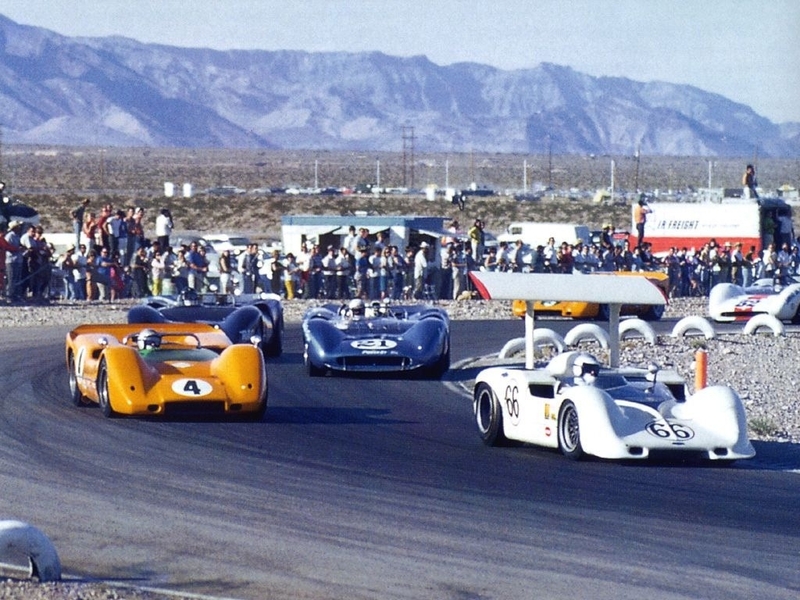 Jim Hall made it tough for himself in ’66/7 by chasing championships in both Europe and the US, Chaparral sought titles in both the World Sporscar Championship and the CanAm. They were always a threat with their unique blend of factory Chev engines and stunning chassis and aerodynamic innovation and quasi General Motors support. 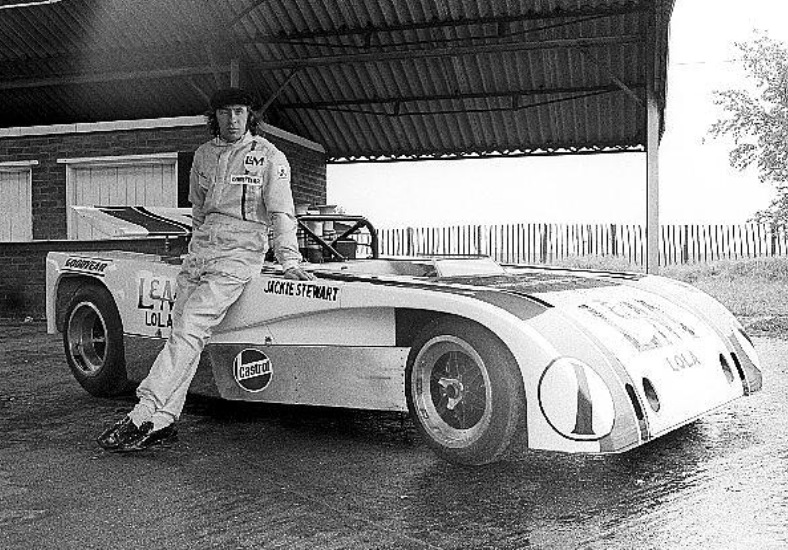 But Bruce McLaren was the ‘dark horse’ challenger. The Zerex became a test-bed for his own cars, the M1 which he raced in both the UK and US through until 1966. 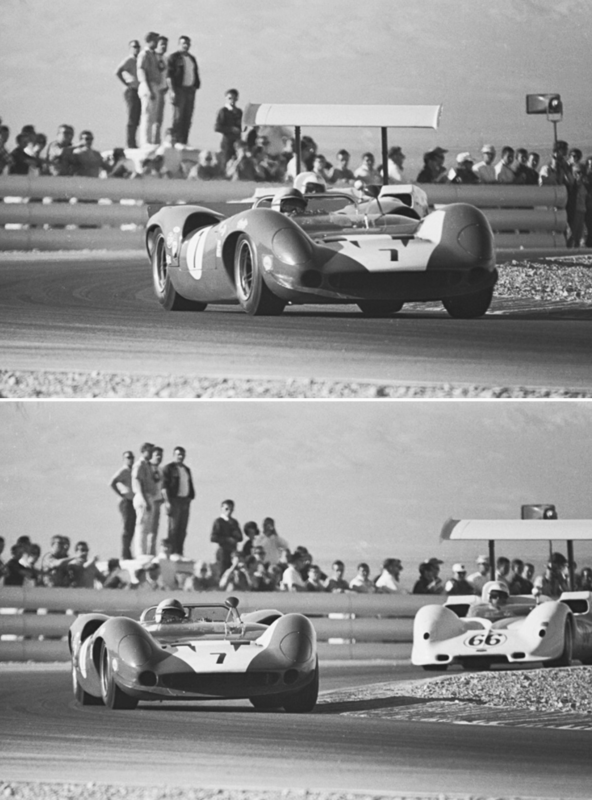 These spaceframe cars handled well and were very light but the aluminium Oldsmobile V8’s which provided the cars weight advantage and balance were also limited by their power; the blocks ‘maxxed out’ at about 4.5 litres so the cars gave away plenty of mumbo to those running 6 litre engines. McLaren and Chris Amon ran Chevs in their factory M1B’s in 1966 so Bruce had clarity about the big engine and its packaging needs, the Kiwi had a clear fix on what was needed to win in the CanAm. 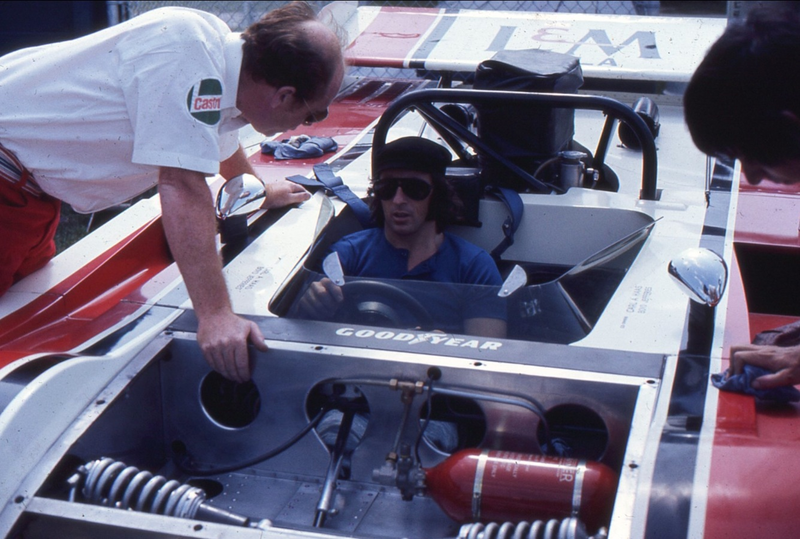 He couldn’t match Jim Hall in terms of innovation but he could with sound design, engineering and construction of a monocoque car with a 6 litre Chev engine and simple aerodynamics, all key elements the T70 possessed and which also needed to be improved. 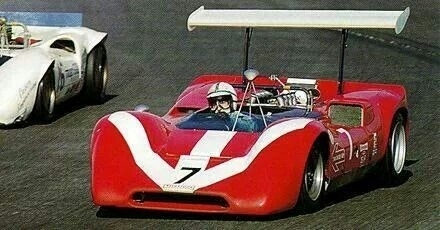 In essence this was the design brief McLaren gave to Robin Herd, the M6 McLaren the ’67 factory car the result. M6 started the ‘Bruce and Denny Show’ with 5 wins and Bruce deservedly taking the championship. The dominance of the McLaren was a function of several elements. 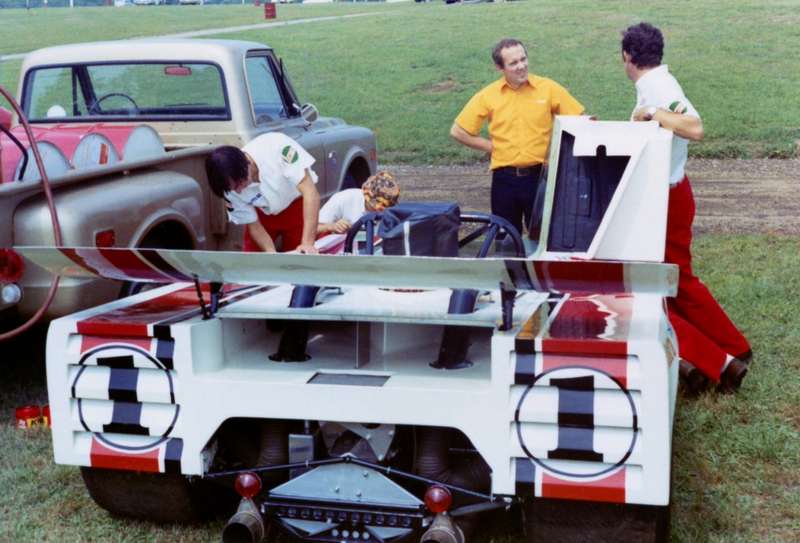 The design and execution of simple well engineered cars which arrived for the CanAm having been shaken down in the UK by Bruce and were race-ready when the short season began was key. 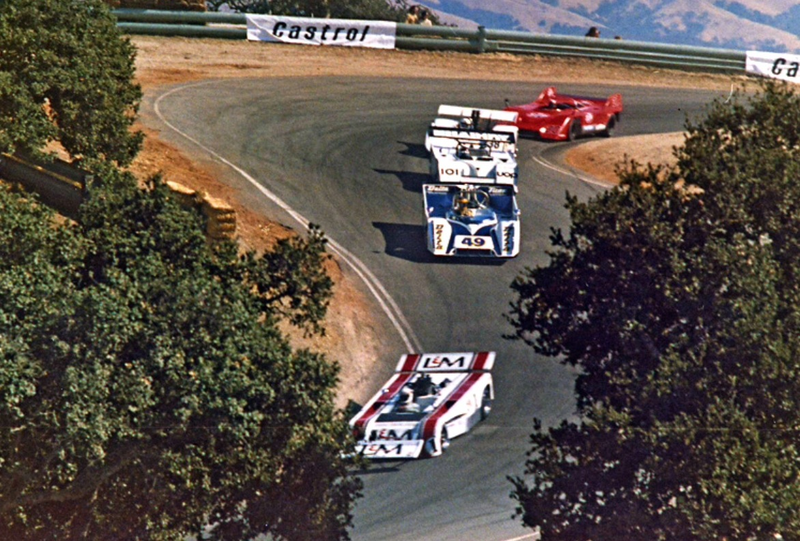 The team comprised 2 cars and world class drivers every year. 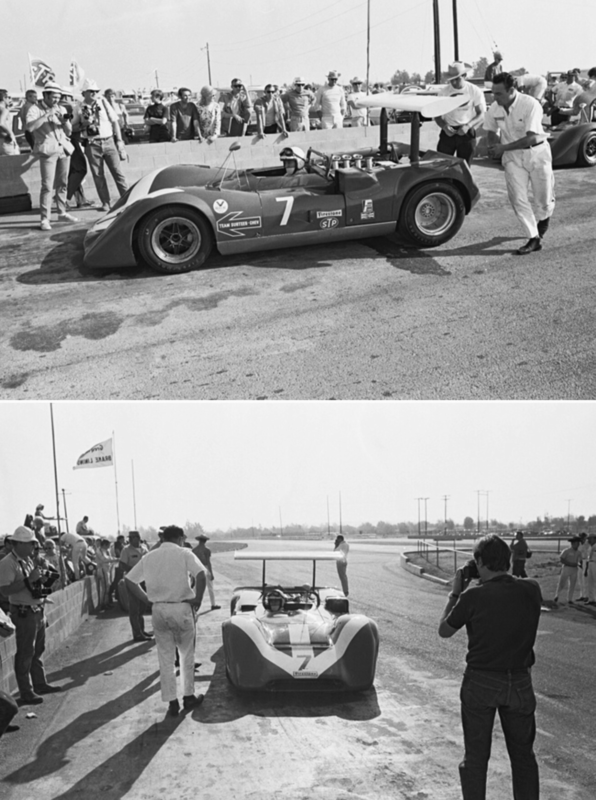 The team had a US base in Livonia, Detroit and it’s own engine program, it’s 6 litre Chevs built by George Bartz and tuned and assembled in-house under Gary Knutsen’s supervision. Finally the team had adequate sponsorship to do things properly. The 1968 McLaren M8 was a ‘clean sheet’ design built from the learnings of the M6; the M8B, M8D and M8F works cars of 1969/70/71 evolutions of the M8A with sufficient change to ‘stay ahead of the pack’. The dominance of McLaren was enhanced by ex-works cars passing into the hands of the best drivers at the end of each season and customer cars available to whoever wanted one; last years works-car became this years customer car, such bolides built by Trojan Industries so the works team didn’t have to worry about pesky customers! 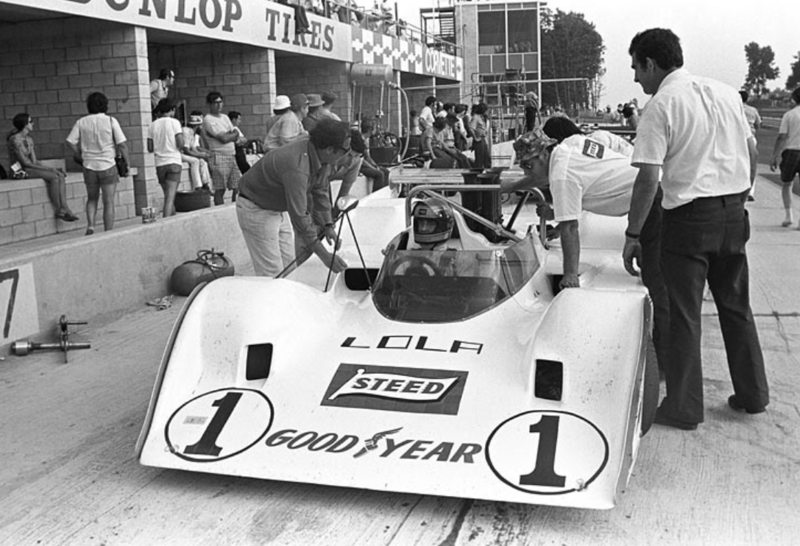 By the end of 1968 at least, Lola’s dominance in terms of grid numbers was over. 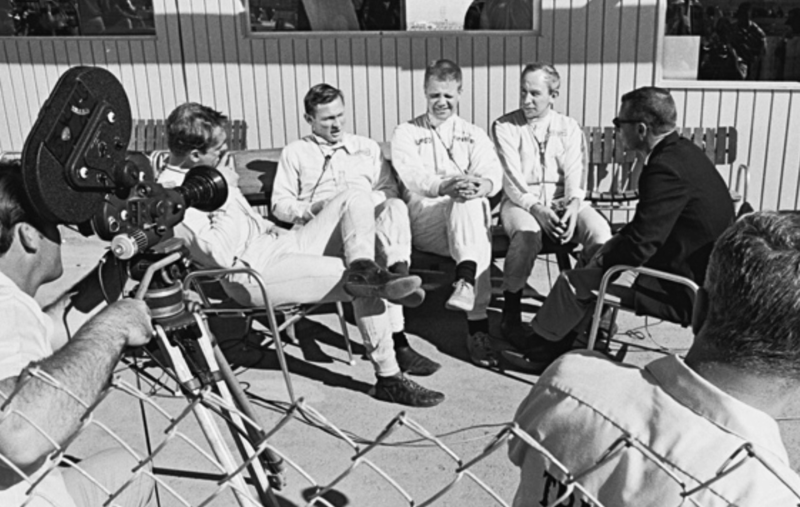 Such was the challenge Lola, Chaparral, John Surtees, Dan Gurney and the other best team owners faced. 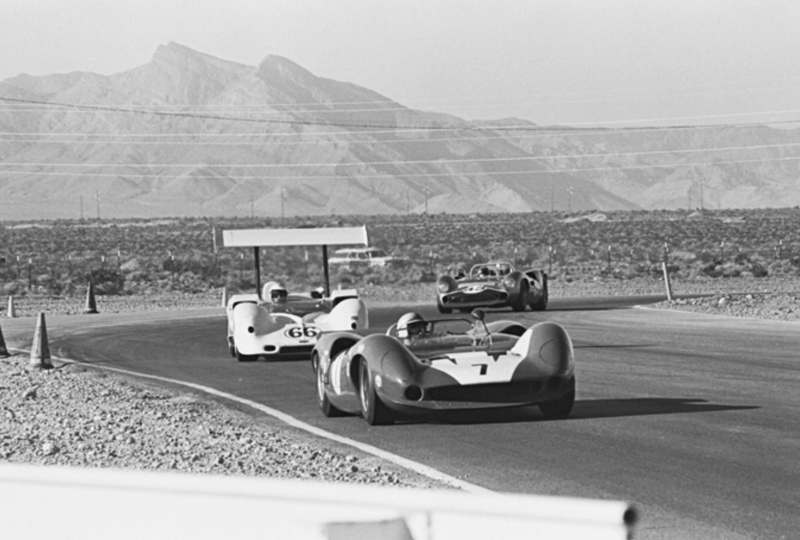 Eric Broadley updated the T70 into the Mk3B for 1967, Surtees and Donohue were 3rd and 4th in the Championship with John taking a win at Las Vegas at the seasons end. 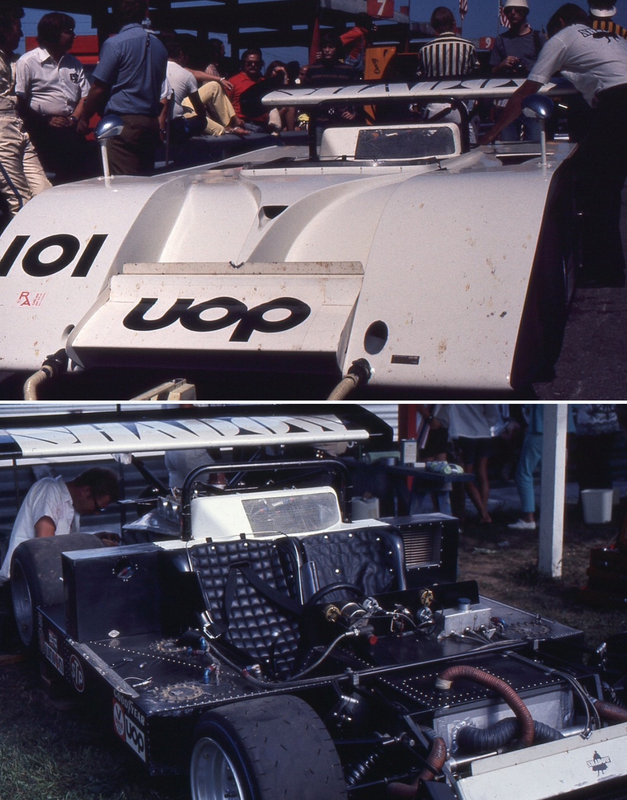 The T160, Lola’s new car for 1968 was in essence a development of the T70. Surtees only raced in several rounds of the championship. 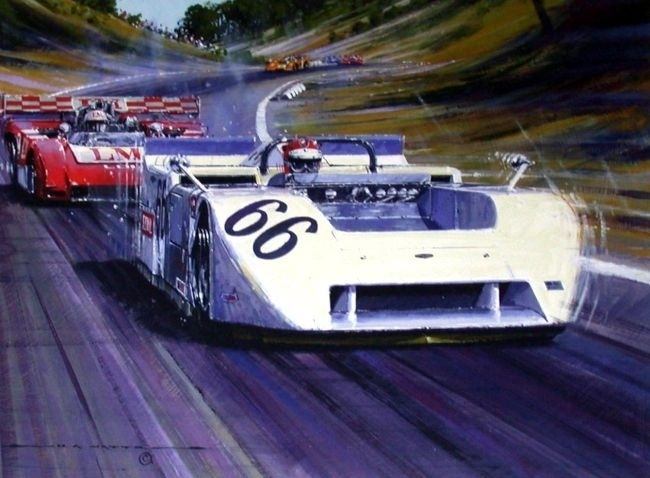 Sam Posey was the best placed Lola T160 driver, finishing 9th in the drivers championship. 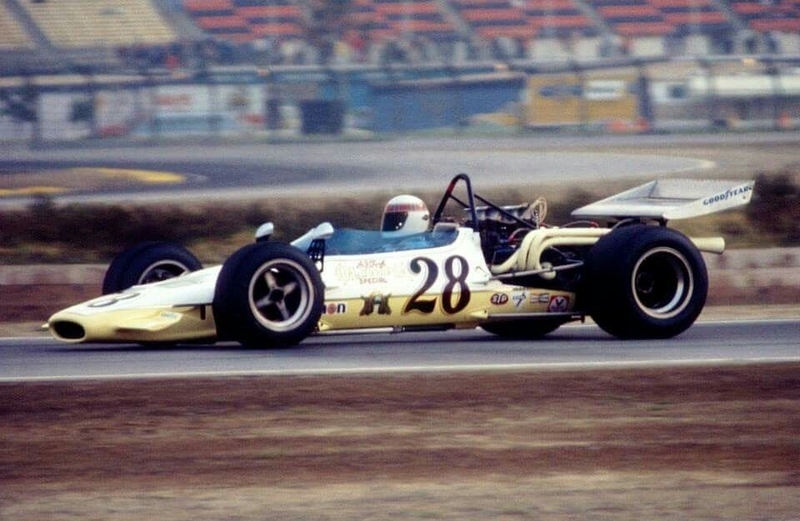 For Surtees it was time to do his own thing, his first customer car was the Surtees TS5 F5000 car for 1969, in terms of the Can Am he jumped ‘out of the fat and into the flames’ Jim Hall’s 1969 Chaparral 2H not his best car. 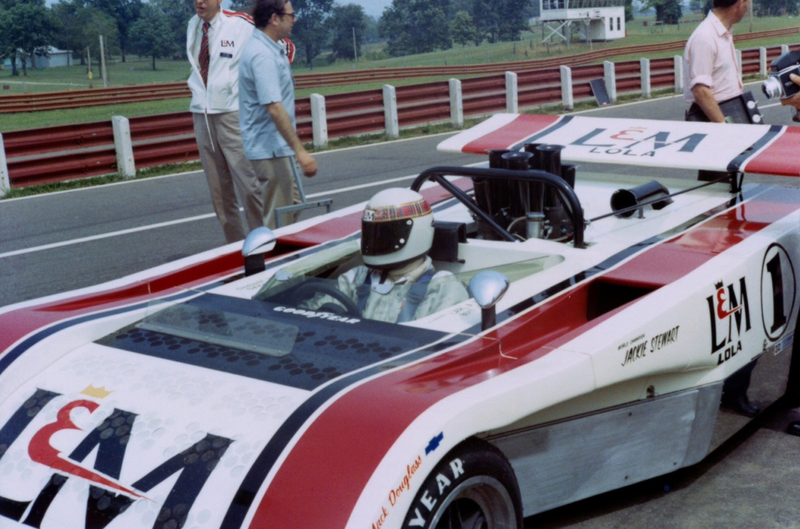 Surtees did get a taste of the M8 McLaren when Hall realised he had built a ‘clunker’ and bought an M12 customer car for John to drive whilst the team sorted the 2H, Surtees revelling in the car on the few occasions he raced it! 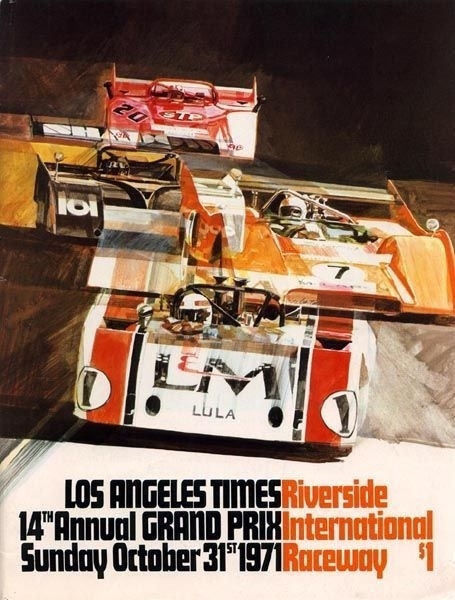 Commercially for Broadley the appointment of Carl Haas as the Lola importer in 1967 was an astute move and provided the base for both firms success for decades with Haas having some of the attributes above to take on the papaya McLarens in the short term. 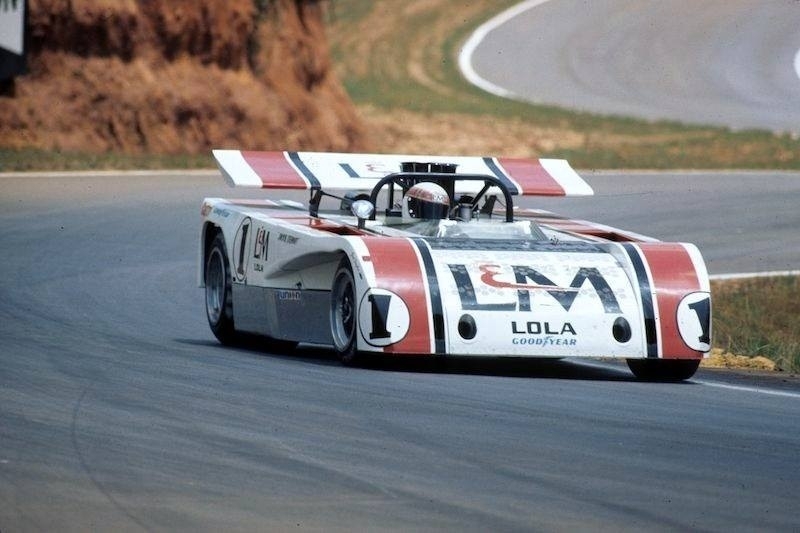 In 1969 Chuck Parsons proved the Lola T163 was not too bad a car, he finished 3rd in the points chase that year whilst the Chaparral was not a threat Porsche first appeared with the 917PA, the CanAm variant of its dominant in 1970 and 1971 endurance racer. 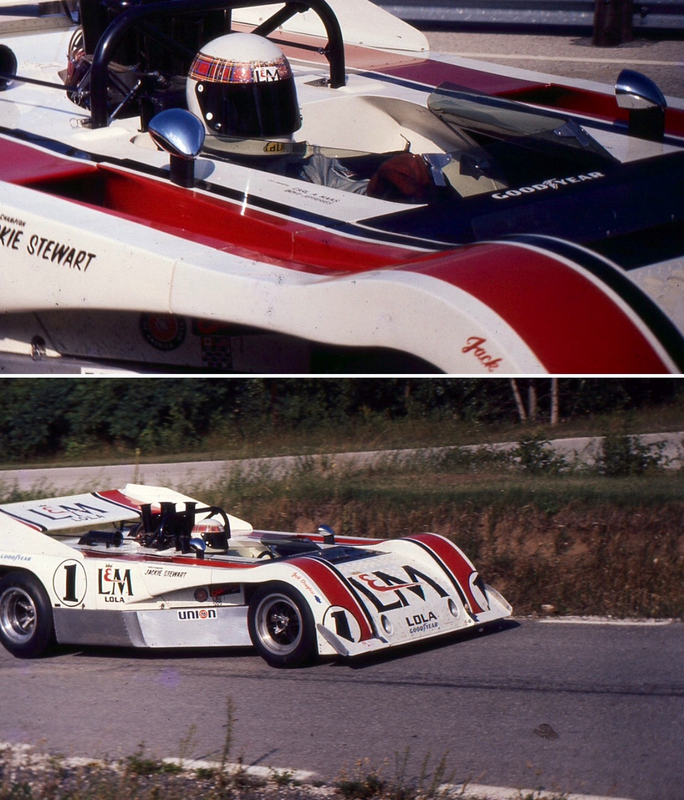 1970 was one of the great years of the CanAm, the sound conservative engineering of the McLaren M8D juxtaposed by Jim Halls outrageous Chaparral 2J Chev, one of the most stunning, original, innovative, epic racing cars ever built. 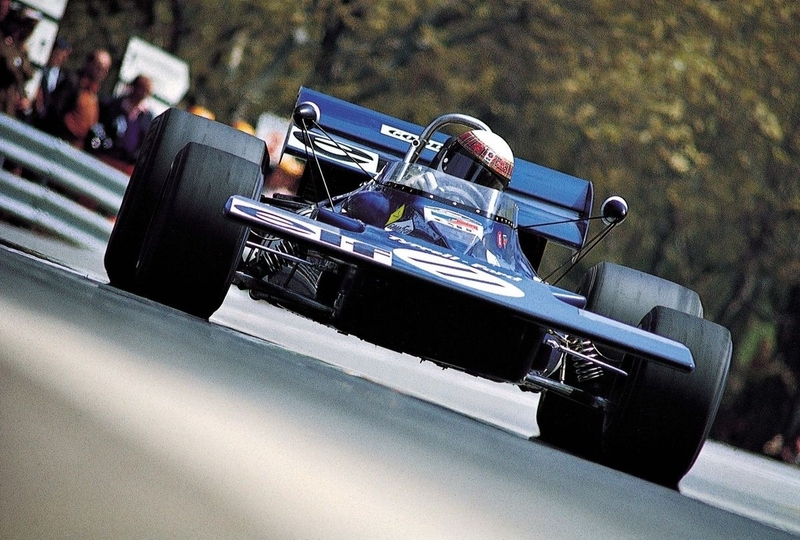 The 2 stroke engines which created the vacuum for its ground effects were its weak link and the cause of too many retirements but the car was stunningly fast whilst it lasted in Jackie Stewart’s and Vic Elfords hands. 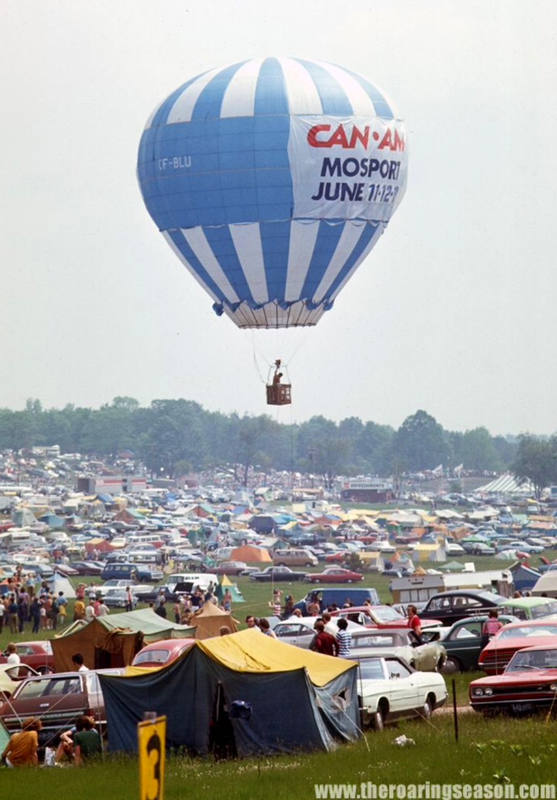 ‘The Establishment’ had it banned at the end of the season of course; ‘movable aerodynamic devices illegal’ but the CanAm lost its soul and it’s ‘unlimited nature’ in making that decision, Hall telling the organisers to ‘go jam it’ and with it the CanAm lost its biggest draw if not its most successful team. 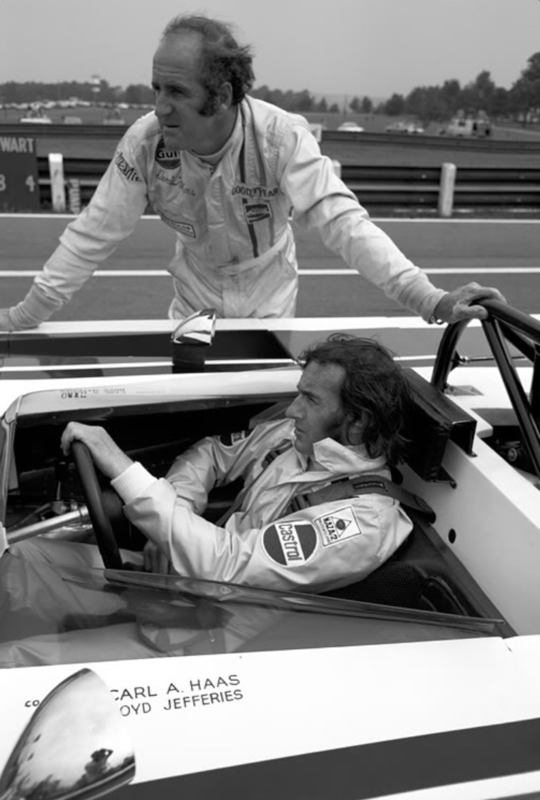 Haas convinced Eric Broadley to design a new Lola for the 1970 season and signed Peter Revson, just peaking as a world class driver, to get the best from it. The gorgeous, swoopy T220 was the result. The car had a very short 88 inch wheelbase which made it difficult to drive, a tyre failure at 180mph at Road Atlanta destroyed the car, but fortunately not Revson. It was a blessing in disguise as the replacement T222 had an additional 10 inches added to its wheelbase and made it a much more competitive car. 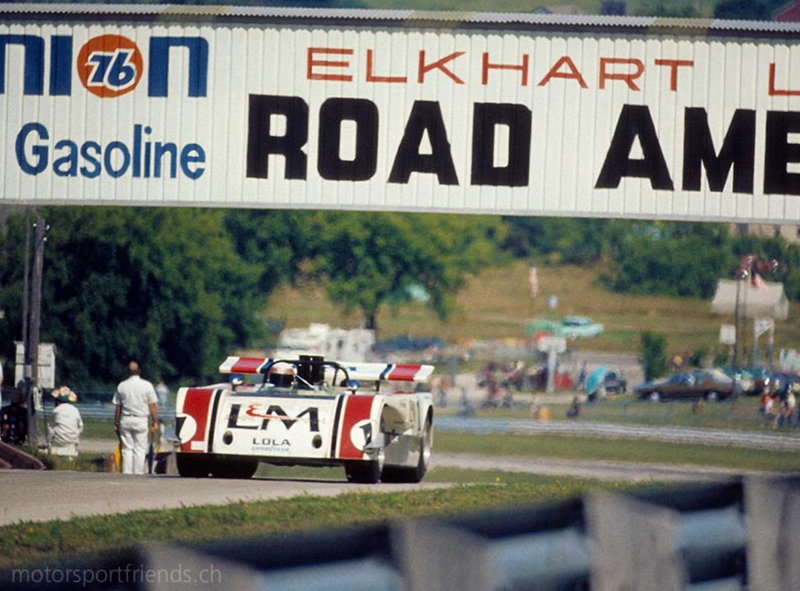 Having said that the T220 was fast if unreliable; Revvie qualified it 2nd at Road America, 3rd at Mid Ohio and 4th at Watkins Glen and Mosport, his best finish 2nd to Hulme at Mid Ohio. 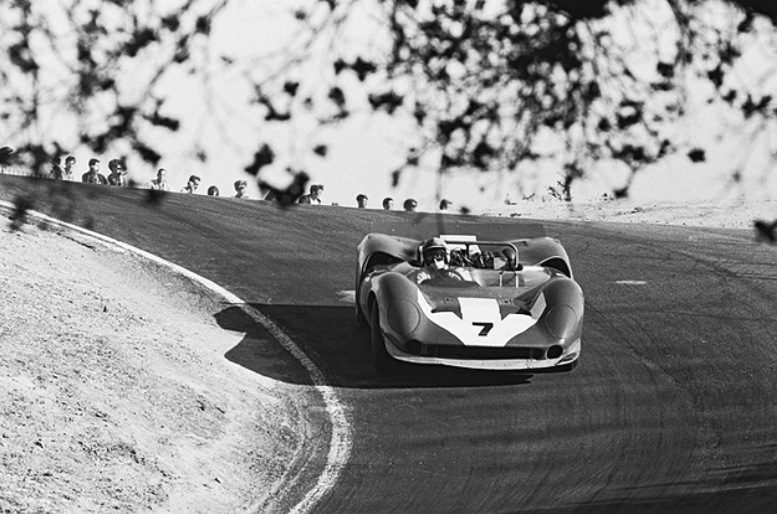 With the longer wheelbase T222 he immediately banged the car on pole at Donnybrooke, finishing 3rd behind the 2 McLarens and qualified 3rd at both Laguna Seca and the final Riverside round for a 3rd and DNF respectively. 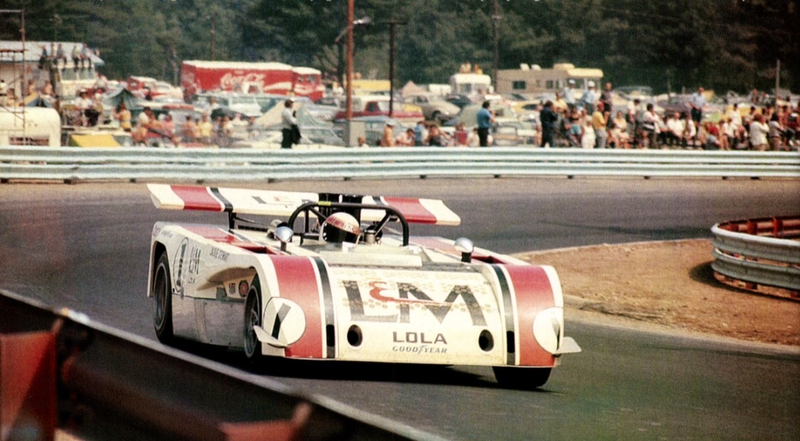 So, by the end of the year the Lola car/driver combination was close to the McLarens, Hulme took the 1970 title, Revson finished 6th. 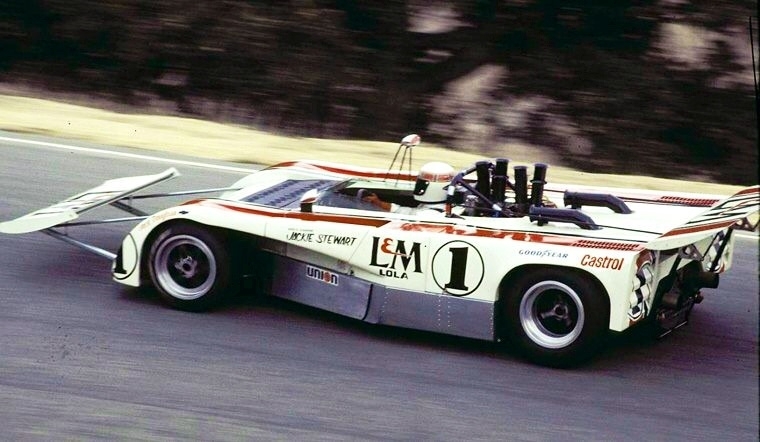 Revson was off to McLaren for 1971, all Lola/Haas had to build was a better car, building on the base of the T222 and hire a driver of the required calibre. 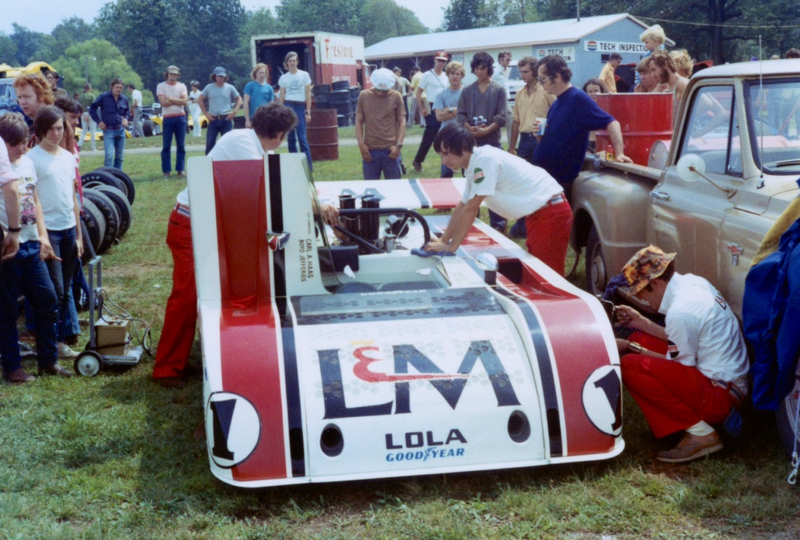 Lola’s mount for Stewart was designated the the T260, the car was designed by Bob Marston with Eric Broadley’s guidance. 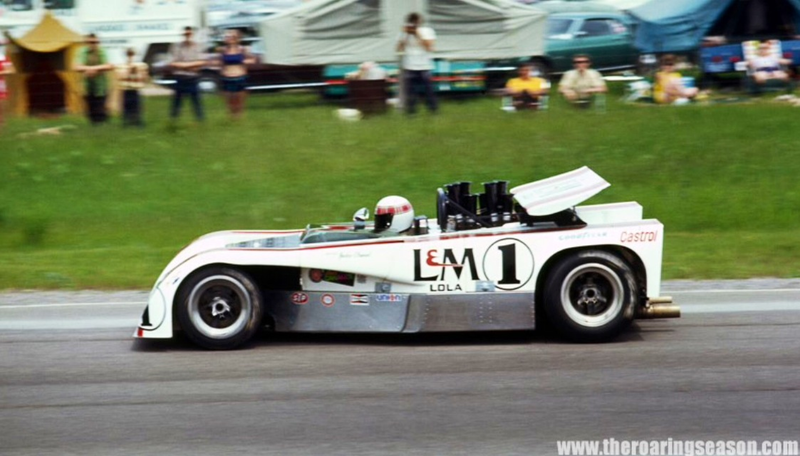 Lola Heritage; ‘The chassis was a…Lola full monocoque in L72 and NS4 light alloys bonded and riveted together with the fuel bags in either side of the tub with a total capacity of 60 gallons. The oil tank was contained in the rear of the left-hand fuel section. The rear of the monocoque extended to the back of the engine which was sandwiched between two bulkheads, a bell-housing supported the gearbox and absorbed suspension loads. 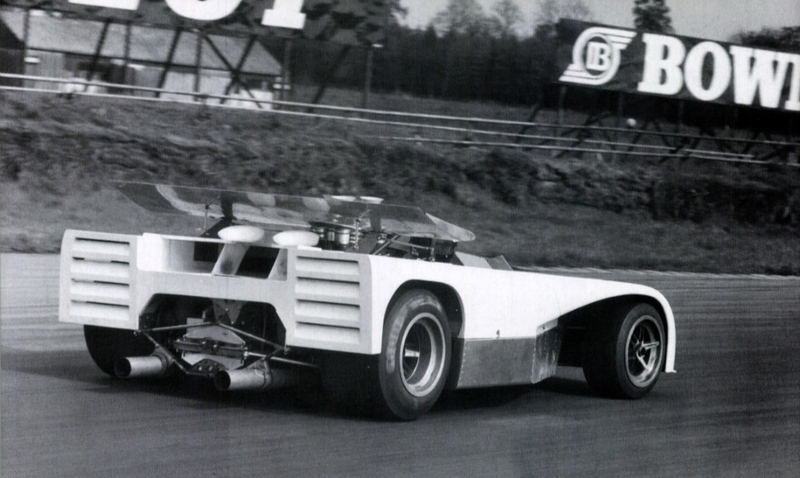 Cooling was via two brass-finned Serck radiators mounted behind the driver’s shoulder level and fed by two large NACA ducts on the top of the bodywork, the radiators vented through large louvres in the rear bodywork. Two oil coolers were mounted behind the water radiators and used the same ducts, an additional transmission cooler lay flat over the gearbox. The bodywork was evolved following extensive tests in the Specialised Mouldings wind tunnel and featured a short, bluff nosecone with gauze-covered holes on the top to equalise pressure. At the base of the nose were two air ducts to feed air to the front discs, at the rear two ram pipes on the top of the rear body section collected the cooling air for the rear discs’. The front suspension on the T260 comprised unequal length wishbones, the upper ones were triangulated to form bell-cranks that operated Bilstein dampers and coil springs which lay almost horizontally across the front of the tub. The unusual spring-medium location freed space for the front brakes to be mounted inboard. Eric Broadley’s intention was to reduce the unsprung weight of the front wheels by moving the brakes inboard from their conventional hub location. This would have permitted the lighter wheel assemblies to ride better over the often bumpy CanAm circuits. 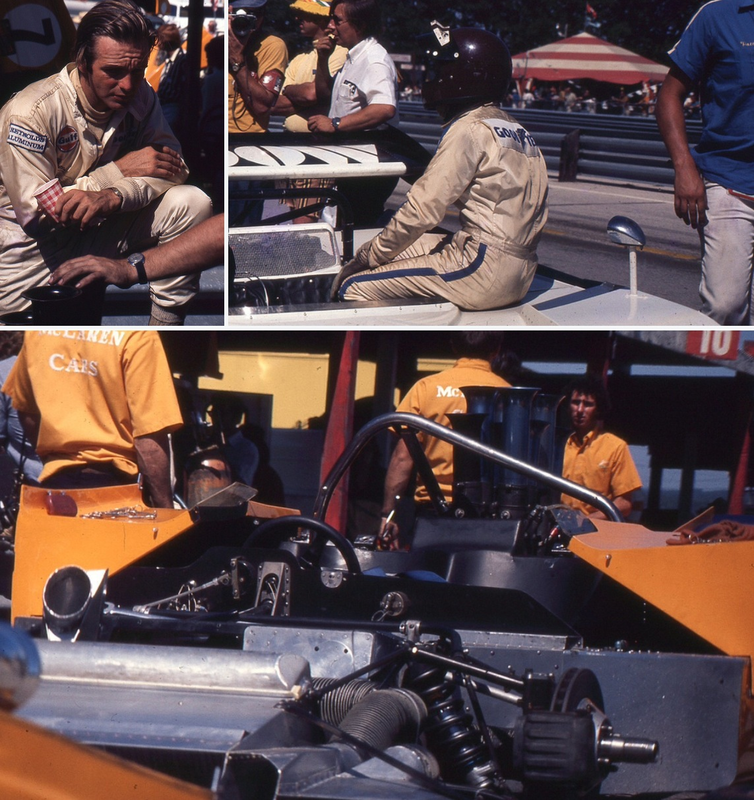 Jackie Stewart was adamantly opposed to inboard brakes after the death of his close friend Jochen Rindt due to the failure of an inboard-brake driveshaft on his GP Lotus 72 at Monza in September 1970. Conventional outboard brake mountings were used on the finalized T260 instead. A tangent is the fact that later JYS was comfortable enough with Engineer Derek Gardner’s approach to inboard front brakes, his 1973 Championship winning Tyrrell 006 being so equipped. Rack and pinion steering was ahead of the front suspension. 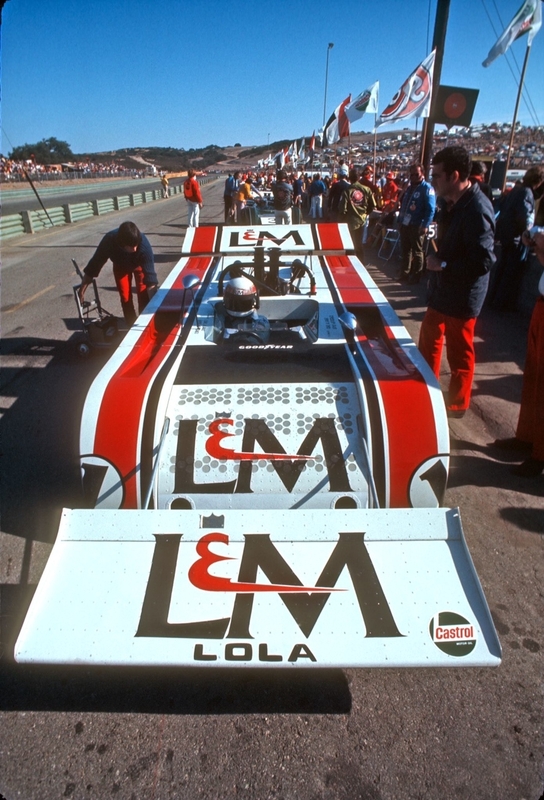 Lola Heritage; ‘At the rear there was a short top link and a long radius arm attaching to the front engine bulkhead, a lower member extended rearwards to a cross-member bolted to the rear face of the gearbox. The springs and dampers fixed to the lower member and transmitted their load to tubular outriggers on the gearbox bell-housing. Lola-made centre-lock, peg-drive magnesium wheels were fitted, their diameter 15 inches with 10.5 inch front and 17 inch wide rear Goodyears’. The battery was mounted in the nose and a Graviner onboard fire extinguisher was fitted behind the dashboard’. 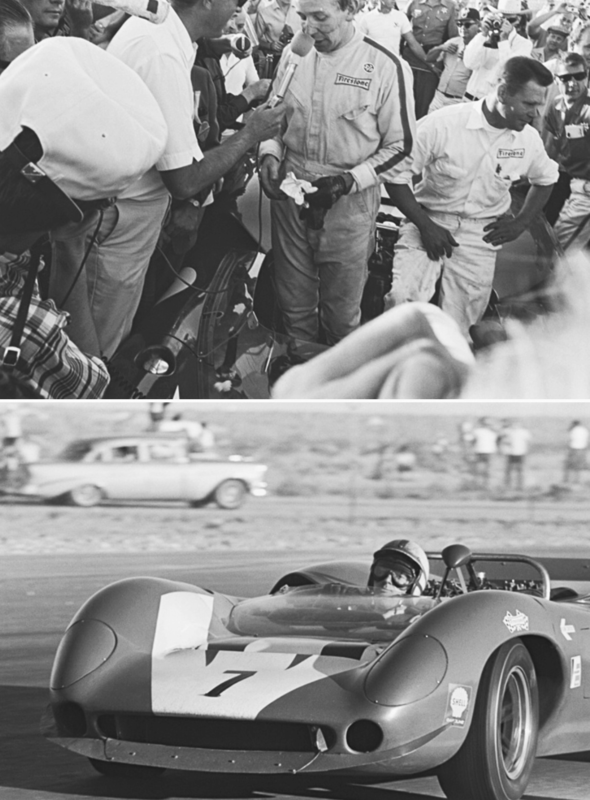 Two cars were built for Haas, chassis ‘HU1’ was Stewart’s race chassis, ‘HU2’ was an unused spare in 1971. 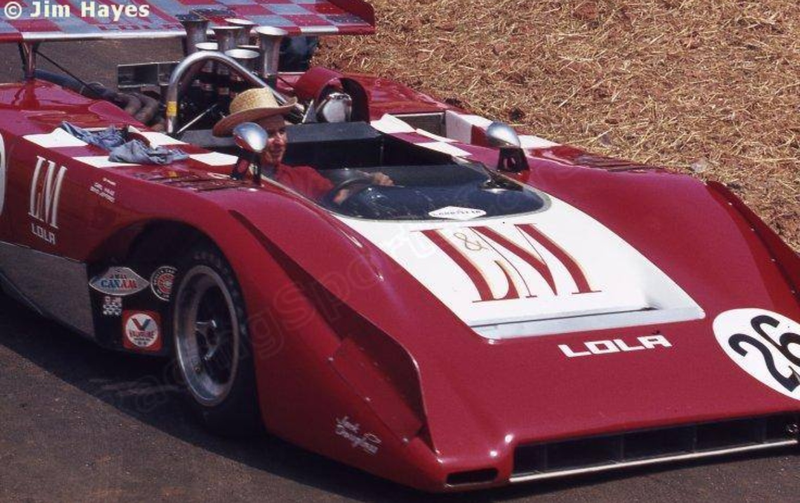 The engine was a 496 cu in (8.1 litres) V8 Chevrolet tuned by George Foltz, it produced circa 700 bhp and 618 lb-ft of torque, Lucas fuel injection was fitted with a Scintilla Vertex magneto and a Hewland LG600 4-speed gearbox transmitted the power. 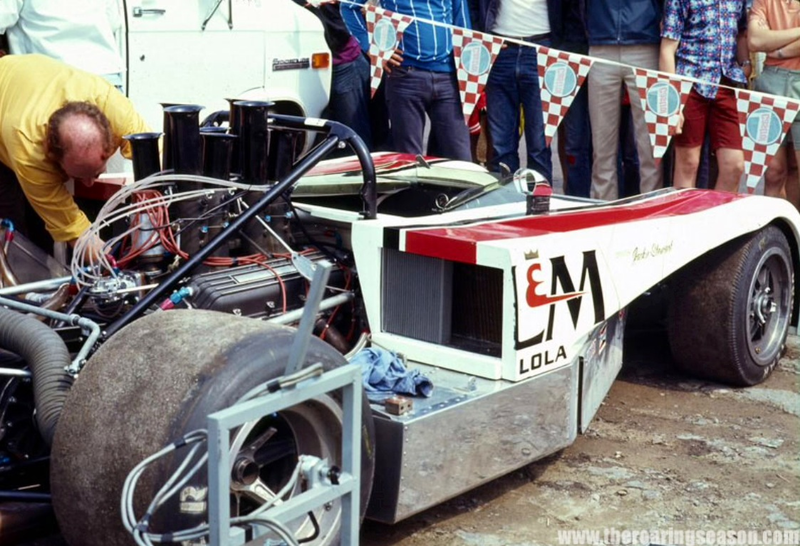 When completed the car was tested by Lola racer/tester/development engineer Frank Gardner who was also turning his mind and skills into getting more speed from Lola’s F5000 T190/2, no doubt the F5000 was a ‘kiddy car’ compared to its 8 litre big brother! Stewart drove the car in a rain soaked run at Silverstone prior to the cars shipping to canada for the season opening CanAm round at Mosport, Canada. 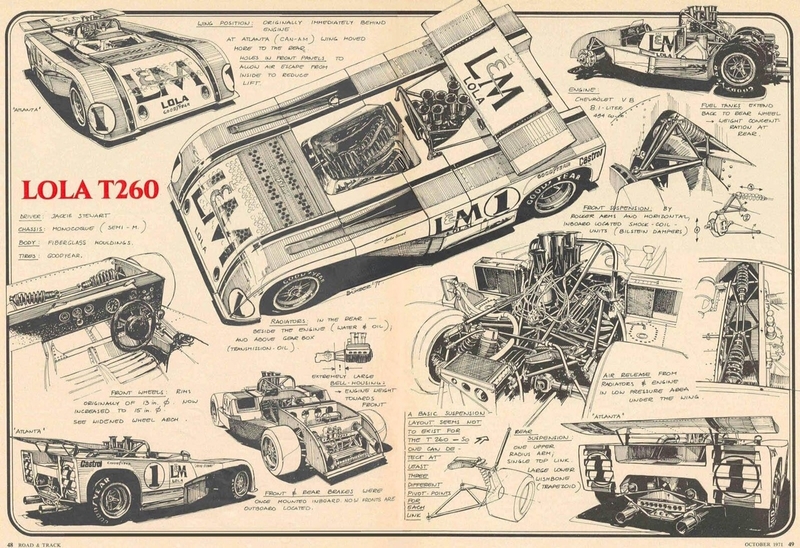 In reality the likely outright contenders in 1971 were the factory McLaren M8F’s, Stewart’s Lola T260, Jackie Oliver’s Shadow Mk2 Chev was a contender, designer Peter Bryant had plenty of experience by 1971. Jo Siffert’s Porsche 917/10 was gathering valuable data for a serious tilt in 1972, in exceptional circumstances (the wet) it was a contender as were a number of the best privateers in either ex-works or carefully developed M8’s; Lothar Motschenbacher, Vic Elford and Tony Adamowicz the most likely. Stewart grabbed pole position from the works McLaren M8F’s of Denny Hulme and Peter Revson and then led the race from Hulme, an oil leak from the LG600 Hewland ‘box resulted in its seizure on lap 18. 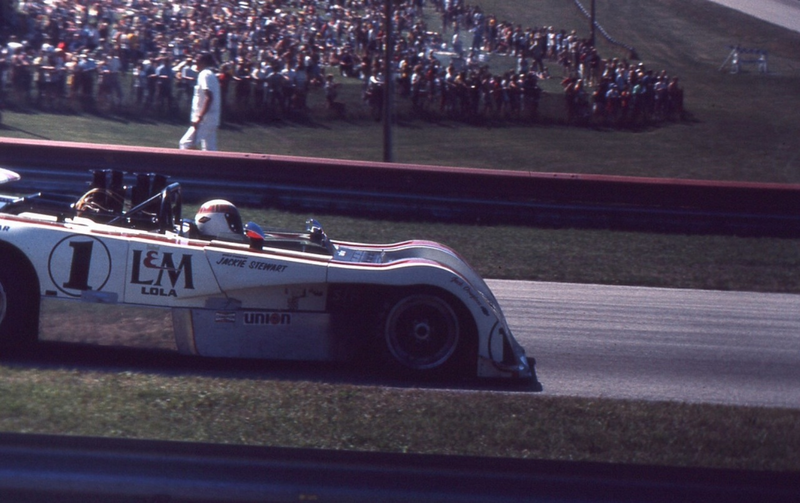 Hulme won from Revson and Lothar Motschenbacher in one the 1970 ex-works McLaren M8D’s. The second round was at St Jovite. 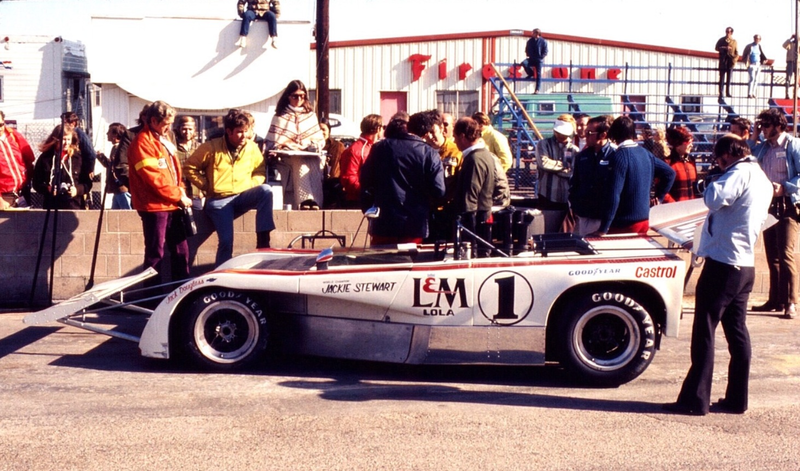 Stewart put the T260 on the front row next to pole sitter Hulme’s McLaren M8F. Denny led from the start but Stewart sat in second until lap 52 when Hulme, tiring from a stomach bug had to slow due to exhaustion. Stewart won the race from Denny and Revson. Stewart recalled in an interview with Gordon Kirby ‘St Jovite was a good win because with that car, that track was hard work! The other race where we did quite well was at Road Atlanta. We led the race then had a puncture and a whole series of other problems but still turned the fastest lap of the race, quicker than Hulme’s pole time’. Revson won the race from Hulme and Motschenbacher. The T260’s speed was not in doubt, it was back on pole again with Hulme and Revson right behind. Stewart got the drop putting the T260 into the lead from Revson, the Lola and McLaren diced until Stewart pitted with another puncture losing a lap while the wheel was changed. Stewart returned to the race and began to fly setting the fastest lap but on the 56th he retired the car after detecting vibrations which proved to be a failing transmission. 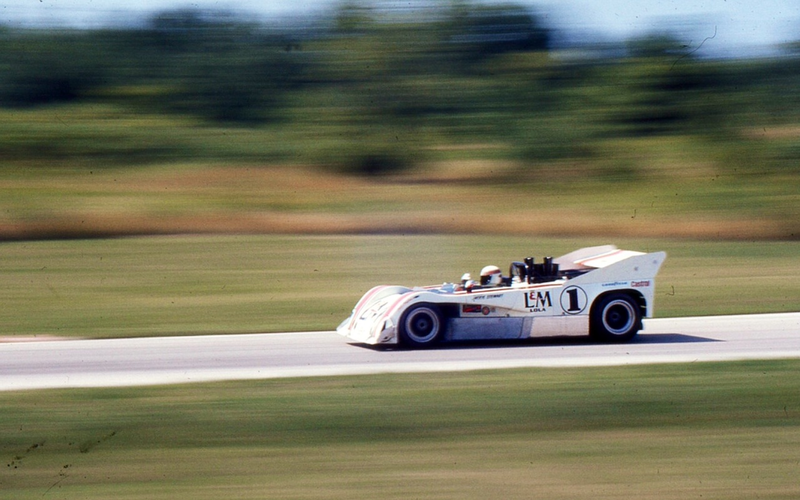 Revson won from Hulme and Jo Siffert in the factory Porsche 917/10. Stewart, famously a successful campaigner for better circuit safety was unhappy with the track; its surface excessively bumpy and the presence of trees and telegraph poles surrounding the course meant mistakes would be punished severely. Much overnight work was carried out to remove some of the trees and poles and add straw bales where possible but after looking at the result Stewart declared he would ‘run but he wouldn’t race’. Stewart’s position could be appreciated after the bumpy track caused 3 rear suspension failures to the T260 during qualifying. Stewart qualified 3rd and was 2nd behind Revson at the end of lap 1 but the McLaren drew away as Stewart drove well within himself. 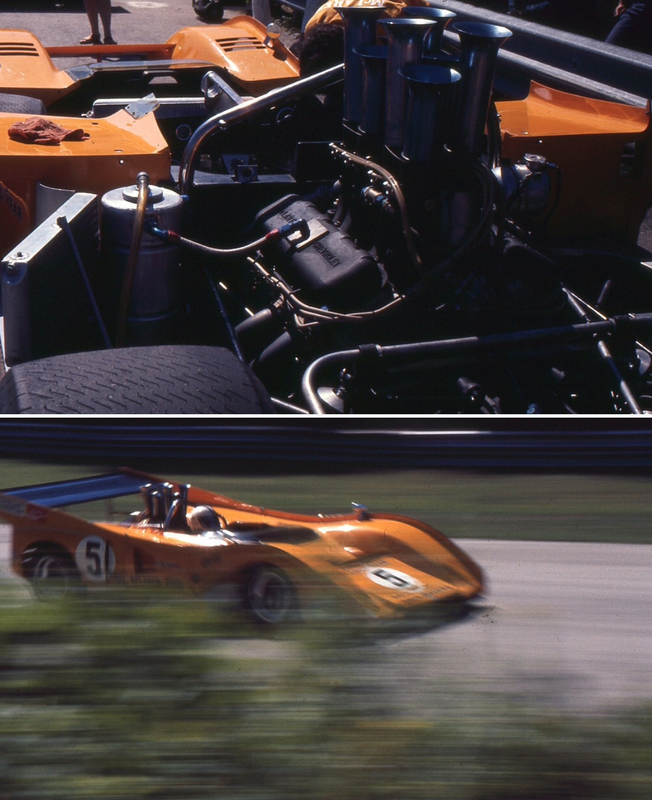 On lap 72 Revson’s driveshaft universal joint failed (the same problem had sidelined Denny Hulme) and Stewart took the lead and race win from Siffert’s Porsche and Tony Adamowicz’ ’69 ex-works McLaren M8B Chev. 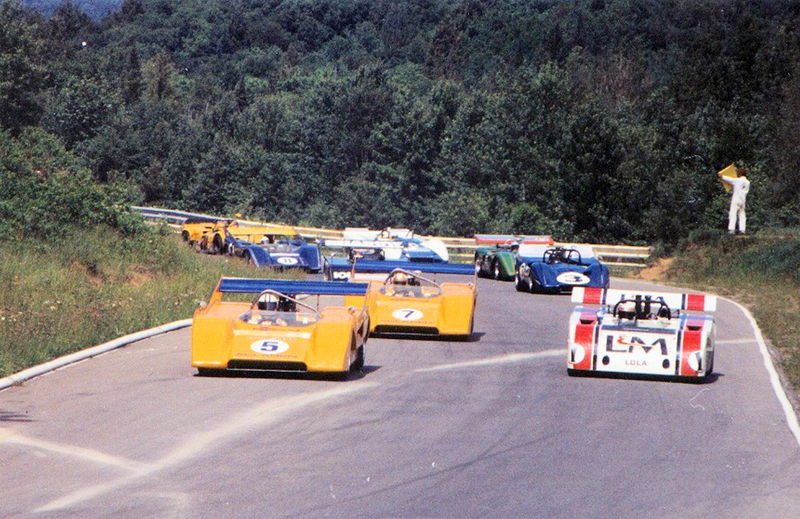 From this point on the continual development of the McLarens told whilst the Lola effort didn’t improve enough. McLaren were a well drilled team and both drivers were experienced campaigners with whatever changes needing to be made could be done quickly in their Livonia, Detroit workshop or back at Colnbrook if necessary. 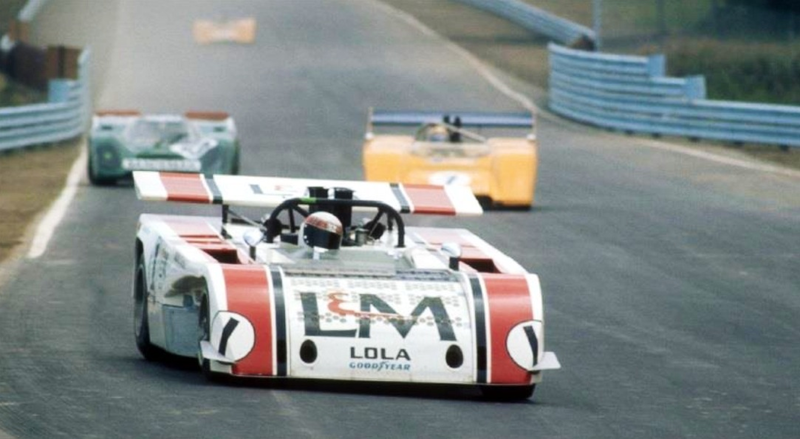 Whilst the T260 was effectively a works effort run by the marques US importer, Lola were at their core a manufacturer of customer racing cars with many customers, not a race team with only one focus. 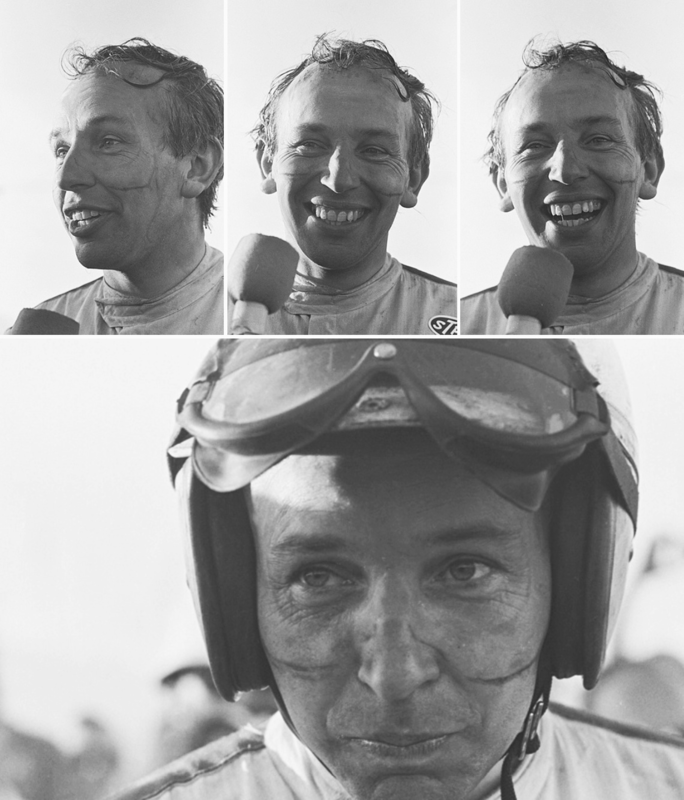 ‘The car was very short wheelbase and very difficult to drive. 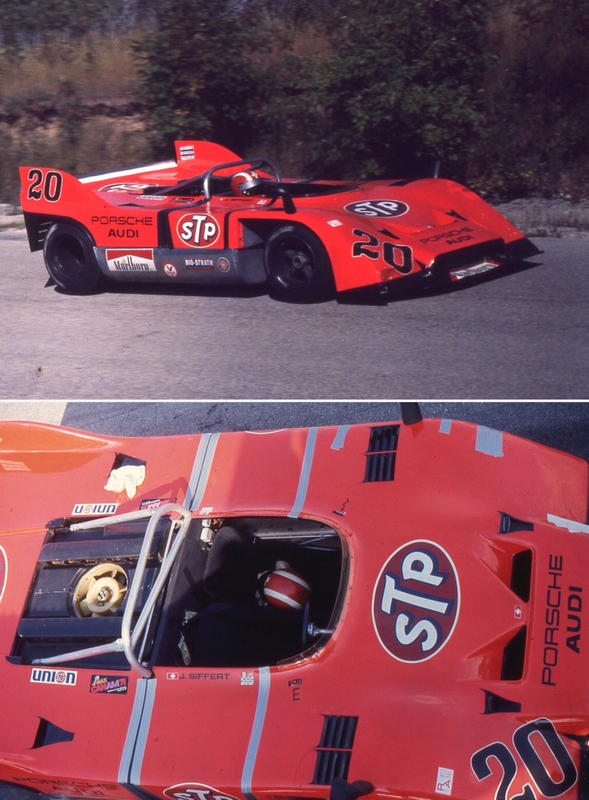 In comparison to the McLarens, (Stewart was approached to drive for them in 1972 and actually signed to do so but withdrew when the extent of his health problems were clear) the car was just a monster to drive and we were just trying to keep up’. Stewart said the Lola T260 was the most physically demanding car he raced in his career ‘On the very fast circuits like Riverside it was awfully tricky because you never knew where you were going’. In order to make up for its shortcomings ‘I sweated more. It was just a difficult car to drive. There are some cars which are easy to drive and others not and that was one of the ones that was not’. 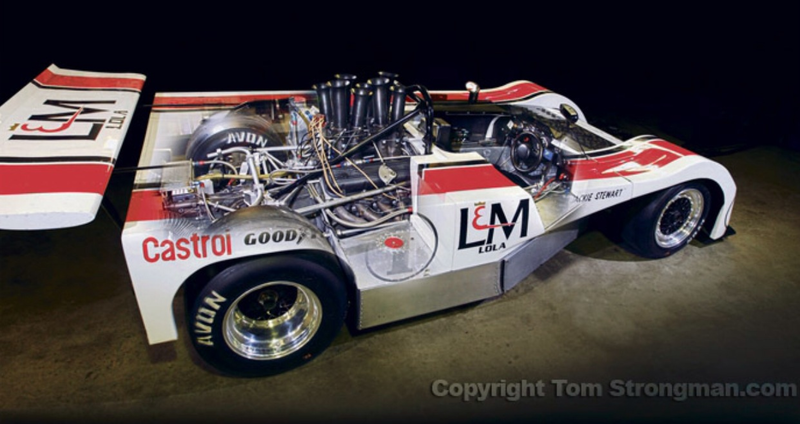 In a contest for the worst car he ever drove; ‘The Lola T260 CanAm car would probably make that one…the H16 BRM runs it a close second’. The main problem was dire understeer in addition to ultimate twitchiness at speed. 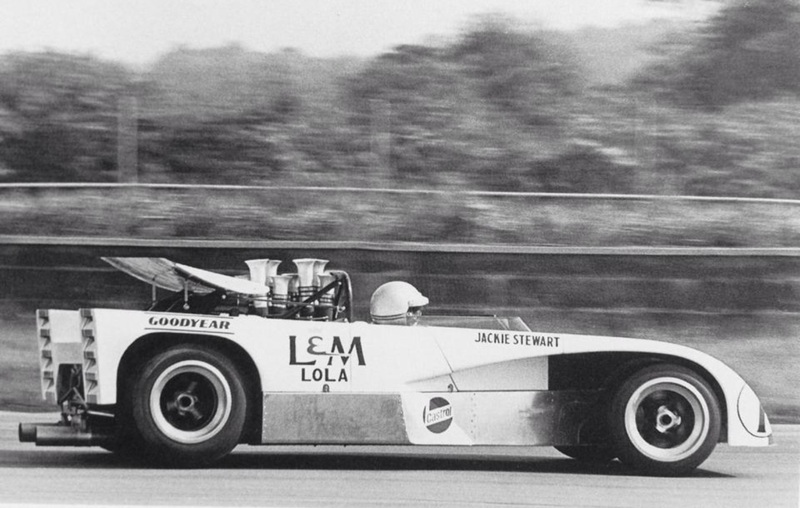 The Lola’s blunt nose was dotted with mesh covered holes through which the underbody air could pass. In theory this helped provide some downforce. In its initial guise the shape of the front didn’t seem to have any obvious way of providing grip. Broadley deliberately opted not to have a fashionable chisel nose. But the lack of downforce at the front was borne out by the position of the giant rear , which was usually far forward, just behind the injection trumpets in an attempt to achieve some sort of balance. A combination of racing around the world in 2 series and lots of promotional work gave Stewart mononucleosis. ‘I was flying back and forth from Europe to do F1, i won the world championship that year and 2 CanAm races, but i also got mononucleosis (glandular fever), a really debilitating disease that took your energy away. You couldn’t sleep and yet you were overly tired. So it was a tough year, a really exhausting year’. Its interesting to reflect on Jackie’s comments on the differences between the two cars; in fact both the T260, which retained the same wheelbase as the T222 and the ’71 McLaren M8F had 98 inch wheelbases. 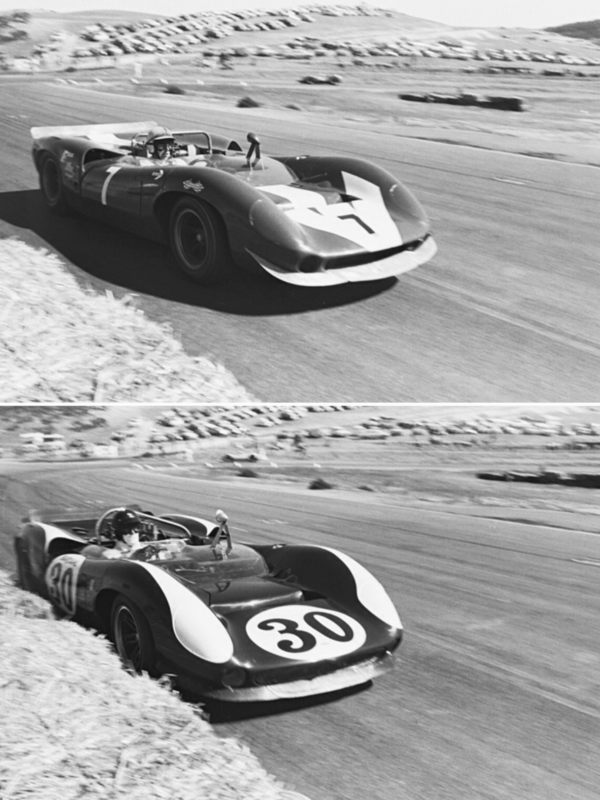 The front/rear track of the Lola was 58 inches, of the M8F 60/57.75 inches. 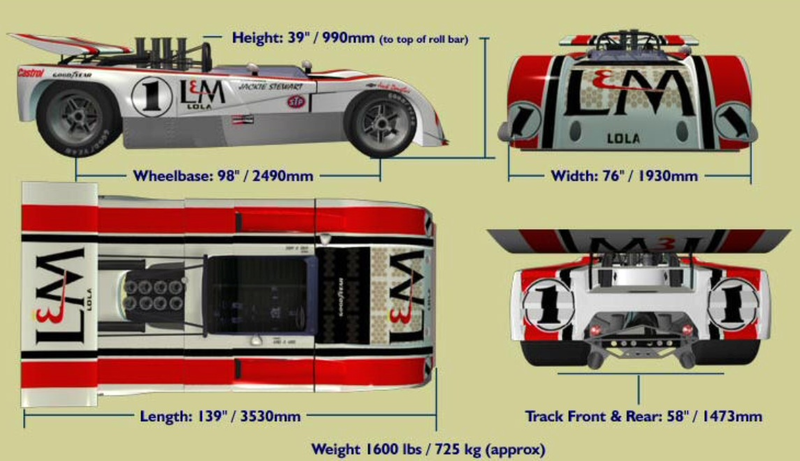 The overall length of the Lola was 139 inches compared with the much longer M8F’s 167 inches. The aero treatment was radically different of course, a lack of downforce something the team chased progressively throughout the season. Stewart was third fastest in qualifying but his engine, also used at Mid-Ohio was tired. A new engine was fitted for the race but high temperatures during warm-up were hoped to be vapour lock in the cooling system. Stewart ran second early on but after 10 laps the engine was smoking, Stewart parked it. Later examination showed a dropped cylinder liner was responsible for the high engine temperatures. 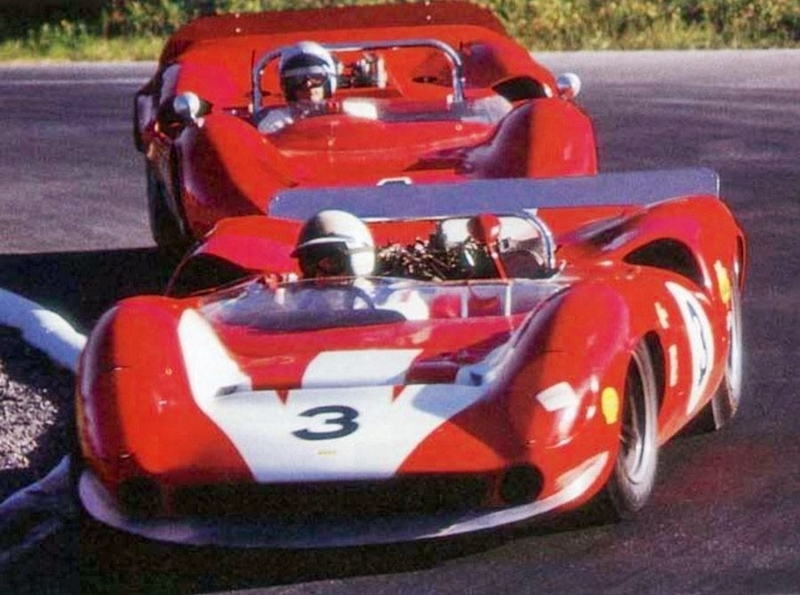 Revson won from Siffert and Vic Elford’s McLaren M8E Chev. 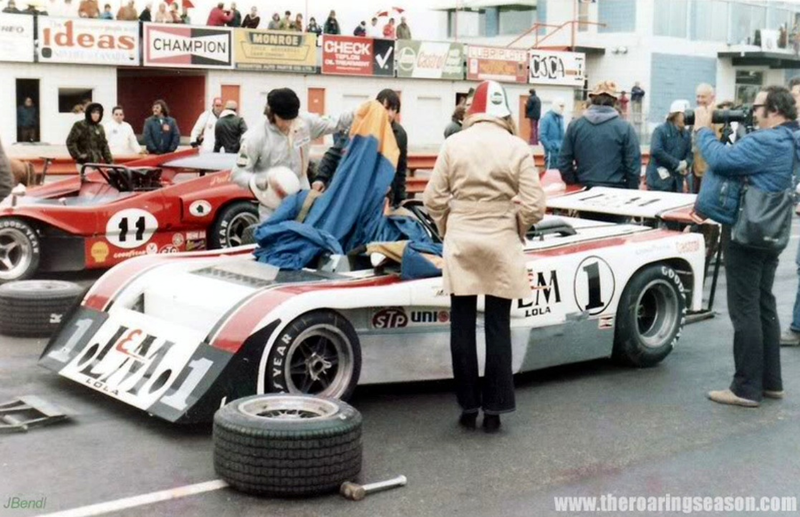 T260 had revised rear suspension but the McLarens were continually being developed as well, Stewart’s 3rd fastest time 2 seconds adrift of the factory M8F’s. Stewart got away well and led for 2 laps until Revson found a way past, Hulme was unable to pass Jackie as the McLaren was losing grip in the Lola’s slipstream. The positions remained until lap 22 when Stewart felt something amiss and pitted, nothing could be found, he resumed in 10th a lap and a half down. The Scot raced the T260 back to 4th but another puncture saw Stewart back in the pits, the T260 finished 6th, two laps down. Revson again won from Hulme and Gregg Young’s McLaren M8D/E Chev 3rd. The T260 featured a revised nose shape designed to give more downforce, the rear wing was moved back to balance the new nose. Stewart qualified 3rd again. Jackie had a great start on the wet track and led. The T260 was handling well in the rain, the Scot extended his lead over Jackie Oliver’s Shadow and Hulme’s McLaren. Stewart was still leading at half distance but a trip onto the grass when lapping Motschenbacher’s M8D lost the Lola’s handling balance. Gradually Hulme closed the gap and he suddenly found himself in the lead with 13 laps remaining, the deteriorating handling caught Stewart out and he spun. The T260 resumed in second but with it’s competitiveness lost Stewart settled for a safe 2nd. Jackie Oliver finally got the Shadow Mk2 into the points in 3rd. 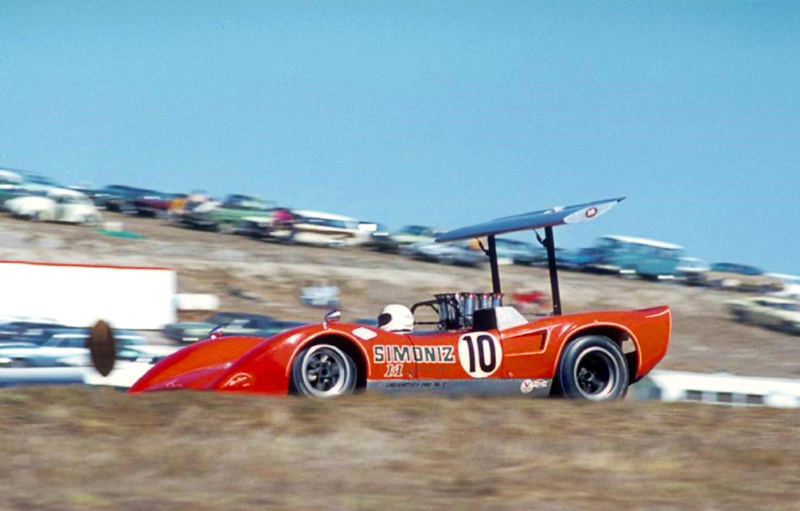 At Laguna Seca the T260 had lost its high downforce nose from Edmonton and now featured a huge, front ‘cow-catcher’ wing projecting out in front of the nosecone. 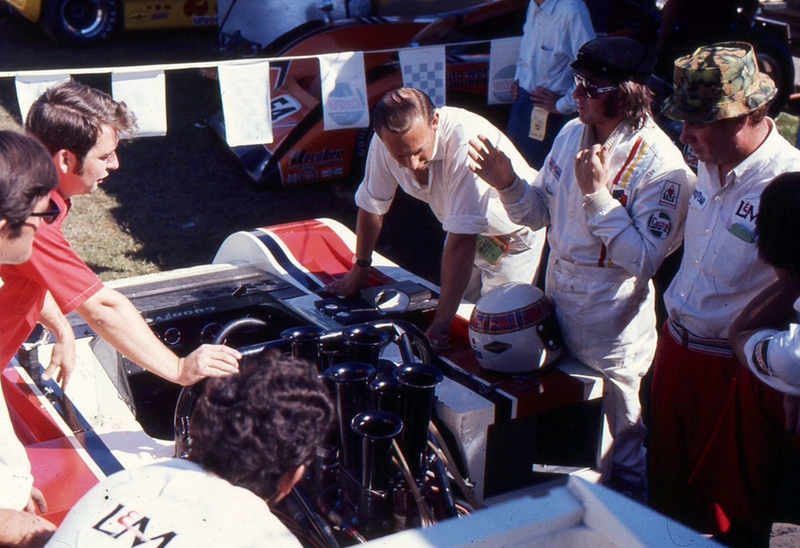 Stewart managed 4th on the grid behind the McLarens and David Hobbs in the Ti22 Chev. Stewart soon passed Hobbs, David raced the Carl Haas ‘factory’ Lola T310 in 1972, and after 10 laps passed Hulme who had some broken valve springs. Revson seemed secure 25 seconds ahead of Stewart but a collision with a backmarker required a pit stop to secure a loose door. Stewart was now 9 seconds behind. Revson started to pull away again but with 20 laps to go Revvies engine lost power, he nursed it over the remaining laps but with 2 to go the M8F was puffing blue smoke. 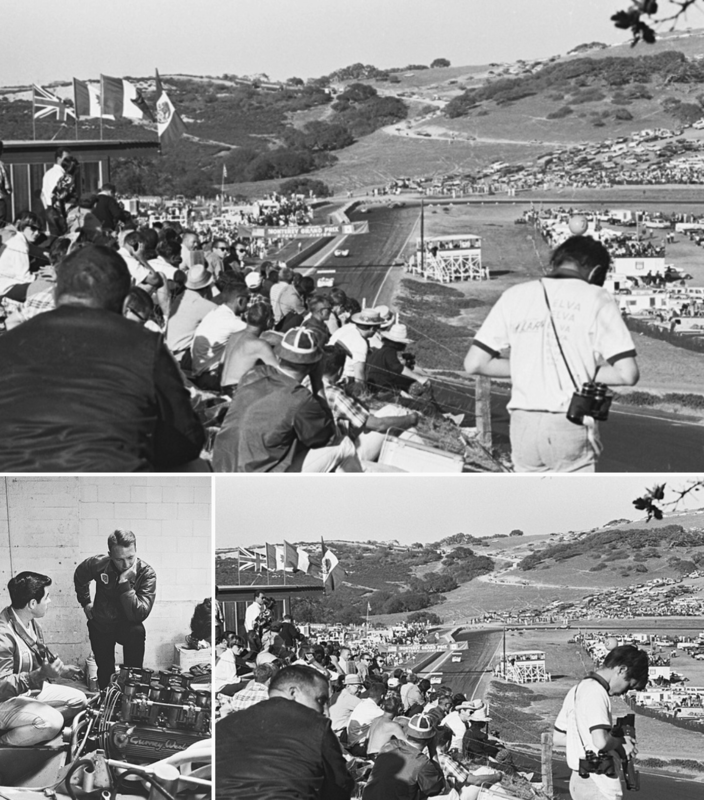 He drove the last two laps cautiously to win and but Stewart who took the chequered flag as Revson had been shown a black flag, Revson claimed he hadn’t seen it. The Carl Haas team protested Revson and the results were pending for some hours but eventually Revson got the win but received a $250 fine. Hulme was 3rd. The series final round was at Riverside on October 30, only 3 1/2 short months since the series commenced in mid-June. Stewart again qualified 3rd, the T260 now having bigger sideplates on its rear wing. Hulme took the lead at the start but Stewart got up to 2nd as Revson, looking for points to clinch the Championship didn’t make it difficult. 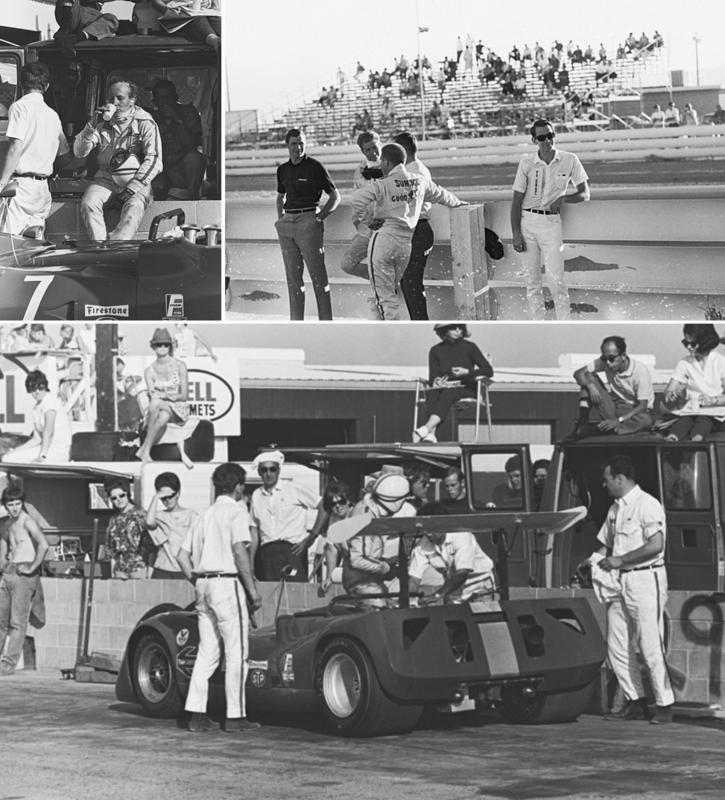 Unable to challenge Hulme Stewart was running happily in second until a piston failed in the big aluminium Chevy on lap 27. Hulme won from Revson and Howden Ganley in the BRM P167 Chev. As Lola Heritage puts it ‘He had been their only consistent competitor over the ten rounds and there was a certain ‘what may have been’ feeling over the whole series, if only reliability had been better and punctures had been less’. In addition to that its a shame the car hadn’t been finished earlier and tested extensively at Goodwood and Silverstone prior to crossing the Atlantic, but it wasn’t and the dominant McLaren’s reaped the rewards.